Romance must run in the blood, a direct descendant of William Shakespeare, this is Lindsay's first romance novel, and most recent book. 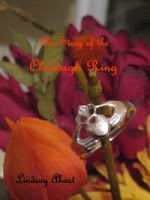 It is based on a true story of how the Irish Claddagh ring came to be. It is a heartwarming story when Michelle, a high society girl in the 1600's, Ireland, falls in love with a fisherman, and how love triumphs over all. Please visit Lindsay's website at http://www.pinklamb.com/ and check it out.